the little one had his hand deep in the cookie bag when i walked in. that’s when he started to cry. words followed tears. tears followed words. “but i had a hard day,” said the boy who is 5.
that’s when i kicked the after-school snack into super high gear. “oh, boy, let me make something special,” i said as i grabbed for the bag and the boy and a red splatterware plate. while i gathered my wares—orange, dried strawberries, banana, and, yes, even reclaimed bag of pepperidge farm brussels–i turned up my ears, cranked open my heart. “tell me what happened,” i said, slicing orange into juicy-spoked wheels. something about dominoes, it turned out, was the source of the tears. something about dominoes not being shared. by now i was sprinkling dried strawberries like rain on orange puddles. while they wrapped up the squeeze, slid onto chairs at the old kitchen table, i reached into cookie bag, pulled out buttery-crisps that the little one had already determined would sop up the hurt. laid crisps on the plate, tucked in between orange wheels. making it pretty. some quirk in my brain thinking that pretty sops up hurt better. maybe because really it soars to a place beyond words, says someone cares, cares enough to make the plate pretty. and, sometimes, you’ll do anything—words, pretty, pepperidge farm–to sop up the hurt. some days that’s what after-school snack is all about. i am an ardent believer in after-school snack, depend heavily on its medicinal powers. i still remember, more clearly i think than any other food of my childhood day, the apples in wedges, the pretzels in twists and stirring the chocolatey powder into deep earthen ooze at the bottom of my green glass of milk. i don’t remember the talking. but i do remember the after-school rite. and i distinctly remember a smart lawyerly friend, a mother of two in that smartland known around here as hyde park (home to the university of chicago and iq’s off the chart, for you who dwell outside the land of 606-something). i distinctly remember her telling me she worked part-time hours just so she could be there for after-school snack. mind you, this was one tough cookie making time for, well, milk and cookie. some things stick with you forever. that one sticks with me. all these years later it defines the minutes from 3:30 on, ’til the talking is done. no matter the stacks on my desk, no matter the deadline, i practically always lift my head long enough for snacks and the news of the school day. little people have hearts, they have hurts, they have sorrows. some days they have triumphs. or just a good knock-knock that makes them laugh silly. today it took oranges in wheels, sprinkled with strawberries. 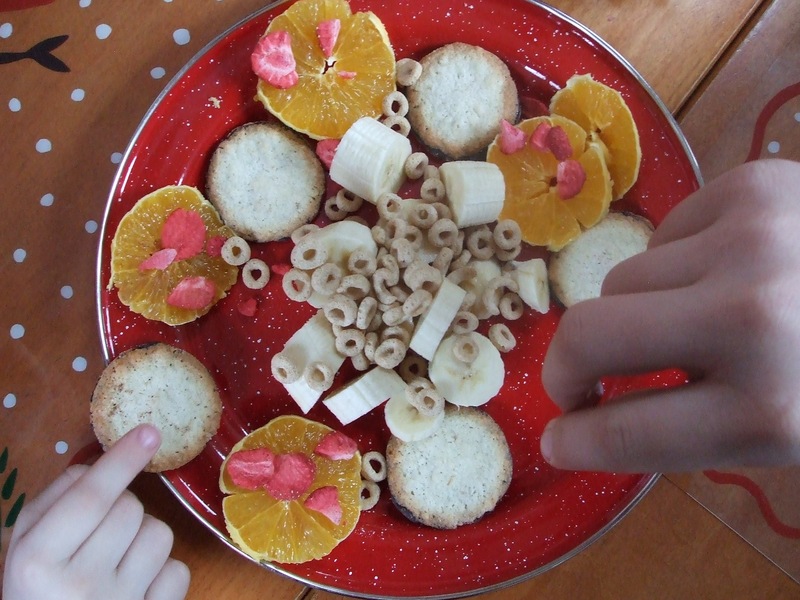 then the boy who loves cheerios thought a handful of o’s might make it more better. so we nibbled, we talked, we indeed made it all better. more better, even. they pushed in their chairs, i rinsed off the plate. we are back to our days now. our tummies are filled, and so are our hearts. post-script: reality check. so, within minutes of hitting the publish button on the above, i waltzed into the kitchen, emboldened. decided to stoke the big boy, the one with a call-back audition later today, with a midweek breakfast extravaganza. when you fiddle on the roof, i figured, you need full-throttle nutrition. the works: challah french toast, bacon, the moon. hauled out the griddle, plopped on the butter. and that’s when all heck broke loose. i was cooking in the dark, you see, and i didn’t see that the butter was turning brown, turning black, turning billowy. but the smoke alarm, it saw it all. and let out a bleep that would not be stopped. i opened the doors. i opened the window. ooops, a mistake. a cobalt blue bottle resting so saintly on the sill tumbled to the ground in a million blue pieces. still the bleeping would not stop. the one who willl not be blogged shot me a glance for this insane noise pollution. the boy who’ll be warbling “tradition,” was standing there shivering. and i just kept opening doors, fanning with dish towels. thus was the state of affairs at our house this morning. i just want you to know that these plans, they can backfire. and the whole block can awake to the shrill sound of my smoking ambition. french toast, anyone? BAM,Can I come over for after school snack at your house? I picked my 2 up at school yesterday and on the way home as we discussed the day and planned for snack before dance my daughter announced she would have baked potatoes for snack – with butter and a little salt please. Did I mind if she did it herself? My older one asked if he had time to make home made biscuits. I thought what ever happened to milk and cookies or fruit and tea? Well we settled on potatoes and pudding and a discussion of life in first and third grade. In so many ways, I can’t believe how many things have changed over time and how these precious rituals are still so terribly important. I completely understand why your lawyer friend chose to work part-time to be present for the after school ritual. After years of not working, I went back but on the condition that I could be home for my girls when they walked through the door. It’s not even so much for them as it is for ME.I would love to have one of jcv’s warm apricot walnut muffins … forget my recipe, how ’bout yours?My heart skipped a beat as I read the tale of the burning butter … just the thought of that gorgeous kitchen going up in flames was enough to make me shiver. Sadly, the beautiful cobalt blue paid the price. i was well into my twenties, or early thirties before 3:00 in the afternoon no longer made me pause to remember school getting out. that impression went deep, and for many years i wondered if that imprint was permanent. it was not. (3:00pm now is a time well past noon but too early for 5:00. clock time for me seems to revolve around food or drink. )growing up, our’s wasn’t a house where food was a respite and after school snacks made a much lesser impression upon me. what i do recall of the snacks was toast, white bread with butter and cinnamon or, during the good times, Kellogg’s cinnamon pop-tarts, toasted. that was best. sometimes frosted, too. i haven’t had a pop-tart since those days, although they are available at the vending machine at work. but i think that is a taste best left to memory alone. i clearly recall the afternoon ritual of the snack at the counter, the tie coming off and chafing in the polyester shirts that were part of our 1970s school uniform. mom watched over us and my older brother was around – lots of motion – and i have no recollection what he ate but bologna does come to mind as i write. (curiously today at work, bologna came up in conversation, referred to – derisively – as “Frenchman’s Steak.” but that’s just the vernacular here. bologna was my brother’s great favorite – rolled up on a toothpick – kabob style. )my brother was, and is, wonderful but i can’t recall a time when he would have wrapped his arms around me and said “we need to talk.” ours was a house much about words and less about food, but i am remembering here the food and not the words. but i do know that feeling of being the younger brother, feeling protected and shrouded from the world.your boy who is five is blessed. PJV-AZ, it’s the dried cherry buttermilk muffins in The New Basics (Rosso and Lukens) (–the most misnamed cookbook ever, I think). I cut the sugar (mistake #1) and swapped the dried cherries for apricots and walnuts (mistake #2). What I really want is something wheat germy and brown sugar streusselly. For after school we like to mix peanut butter with honey and cinnamon and dip apples in it–peeled of course for the 3 year old who will eat them no other way. School’s lately so stressful to my 8 year old that afterwards is a pretty silent time of munching and regrouping, a regathering of wits, breathing deeply and calmly. Not a lot of chit chat. A cool big brother would be greatly appreciated. However, things being as they are, bologna on toothpicks might perk things up a bit. I used to like to bite faces out of bologna, the only way to eat it way back when. Hi All –E-mailing the dear “Pull up a chair” gal about something totally unrelated and we started revealing secrets including this wonderful blog she started.We also talked about baking and she asked if I had a recipe for a streussl-y muffin for an after school treat.I make this as a coffee cake (but it has no coffee in it, so it’s entirely suitable for children and fussy eaters) however, I actually think it would be better as muffins. When you bake it in a bundt pan and put the streusel on the top, it ends up on the bottom when you flip it out of the pan to show the pretty swirls. So you either have a plain looking top, or fliip it again and have a cake sitting on a rounded bottom. I’ve never been happy with either. But the cake itself is delicious! It’s from “Pastries from La Brea Bakery” by Nancy Silverton. She calls it Creme Fraiche coffee cake, but I’ve always and only made it with sour cream and it’s perfect.So if I’m not breaking any etiquette guidelines by going on too long, here’s the recipe modified for muffins:Topping:1 cup pecans, toasted and coarsely chopped1/4 cup plus 2 tablespoons light brown sugar2 teaspoons cinnamonBatter:2 eggs2 cups sour cream1 tablespoon vanilla extract (real stuff only, please)2 sticks unsalted butter, room temp1 tablespoon lemon zest1 tablespoon baking powder1/2 teaspoon kosher salt2 cups granulated sugar3 cups unbleached flourMix topping ingredients and set aside.With an electric mixer, cream the butter, then add zest, baking powder, and salt and mix for 2 to 3 minutes on low. Add the sugar and turn up to medium for 3 to 4 minutes. Scrape down the sides, then slowly add the eggs, sour cream and vanilla while mixing on low until well incorporated.Add the flour in 3 stages, mixing each addition until just incorporated.Fill muffin tins half full, sprinkle on some topping, then add a little more batter and then some more topping.Bake 350 for 15-20 minutes. Sorry to be so inexact, but test them with a toothpick after 15 and you’ll know how much longer they need.Enjoy with children after school or with friends while they’re at school! jcv – just checked back and saw your comment (today is Saturday) after I made another plea for the recipe (see Weekend Update). I still love the thought of apricot walnut … makes my mouth water just typing the words. I think I’ll try to get my fix by making a quick apricot jam glaze and drizzling it over walnut pancakes. Yummmmmmmm. Thanks!